Nottingham head coach Martin Haag says his side must back up their impressive 54-9 win over London Scottish when they host Jersey on Sunday. The fixture is the club's second annual Ladies Day charity match. And Nottingham will don pink shirts for one day only to mark the occasion as they look to raise funds and awareness for Breast Cancer Research. 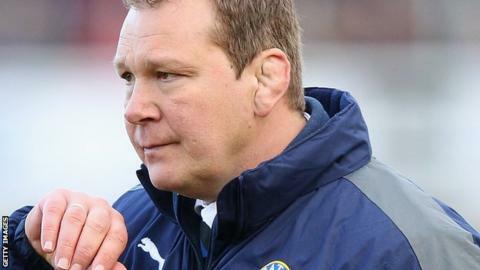 Haag told BBC Radio Nottingham: "The challenge as a good team is to back up the win over Scottish week to week." Championship newcomers Jersey have lost all of their league games this season but Haag is adamant they will provide a tough test. "They are a good team they have scored a lot of points in this league," Haag added. "The scored 31 at Rotherham the other week. They have a big pack and a couple of big boys in the centre. They are a difficult team. But if we get our game right and work hard then we are a handful for most teams." Nottingham proved far too strong for London Scottish last time out, racking up seven tries in a one-sided contest. "Barring the first 20 minutes when we weren't accurate enough, we were superb," Haag said. "The scrum was outstanding against a really good scrum team. They have taken teams apart so I am really pleased with that aspect. "They were never in the game. They only got in our half maybe twice in the game. They made a few errors but we were clinical come the second half and scored a lot of points. "It just shows what we can do when we get our tails up. "Defensively we were superb. We kept to our systems, we got the line speed, shut them down and gave them nowhere to go." Sunday's match at Meadow Lane is part of the club's Ladies Day in support of Nottingham Hospitals Charity, Breast Cancer Research Appeal, which aims to raise £50,000 a year for breast cancer research in Nottingham. "The pink shirts look very eye-catching and it's great to see the players are all willing to man up and sport such a fetching colour in aid of our Breast Cancer Research Appeal," said Samantha Gathercole from the Nottingham Hospitals Charity. Further details - including how to gain half-price entry - are available on the club's website.